Crispy, panko crusted shrimp tossed in a sweet glaze and served with rice. A Chinese restaurant favorite. Make it at home, fresh in 10-15 minutes. Super quick. Say goodbye to take out. Shrimp: Coat shrimp in flour, dip in egg wash then coat in breadcrumbs. Pour a thick coat of oil on a skillet. Heat on medium high heat. Once skillet is hot, cook shrimp 2-3 mins per side until cooked through and slightly brown. Stir then pour sauce in a bowl. Toss cooked shrimp in the sauce while warm then plate. 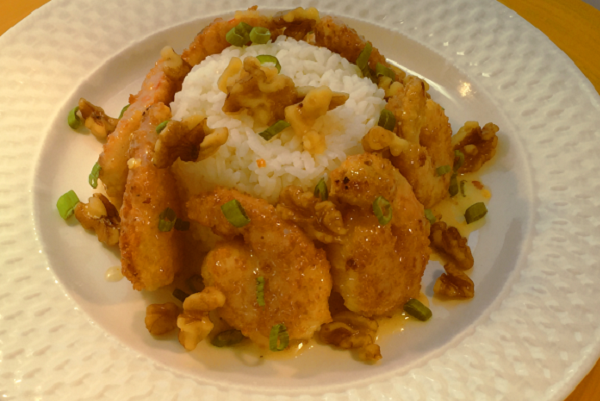 Top shrimp with walnuts & serve with rice. Rice: Microwave rice 3 to 5 mins checking regularly. This is so tasty! I am in love with Maria's meals! 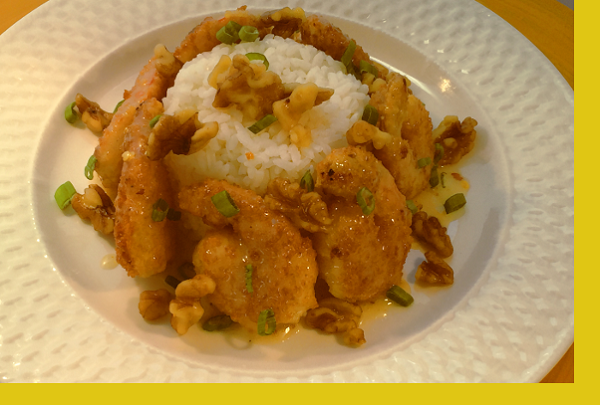 Honey Walnut Shrimp = yummmm! This was the first dish I have cooked from Maria's, and I was very pleasantly surprised! I have never used one of these services before and was not sure what to expect. It could not have been easier! And the taste was simply wonderful. Portions were on the large side, definitely did not skimp on the shrimp. Thank you, Maria's...job well done. Generous portion of shrimp. Love the texture of the cooked batter.The packets make fixing so easy. Loved this meal! This was so delicious I didn't even share it with my kids. I can't wait for this to be offered again. Love the shrimp. Very tasty and easy to fix. Rice was not edible. Came out as a sticky lump. Cooked some Basmati myself and it was superb. This is easily my favorite meal from Maria. The shrimp are big, fresh and flavorful. The sauce that tops it and the rice is savory and slightly sweet and the walnuts are the perfect accompaniment. I would order this every week if it was available. We've enjoyed many dinners from Maria's Gourmet Kitchen, and one of the things I love, is that most of them serve three people even though they say they serve two. Now I have lunch for the next day!